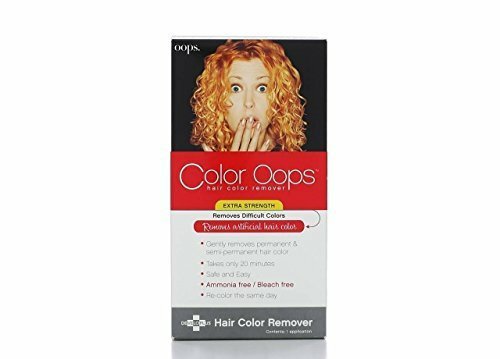 Color Oops Extra Strength is the safest and most effective way to reverse an undesirable hair color application. In just 20 minutes Color Oops corrects hair color by shrinking the dye molecules, allowing you to simply wash them away. Our unique formula is bleach free and ammonia free. Color Oops will not have the damaging effects of bleach or ammonia based products. Color Oops Extra Strength is so gentle that you can recolor hair the same day. Color Oops Extra Strength takes you back to your lightest shade. It will return your hair to its natural color if the artificial hair color applied is darker than your natural shade. If the artificial hair color applied is lighter than your natural color, your natural pigment has been chemically lightened and although Color Oops will remove the artificial dye from your hair, ultimately your hair will be the chemically lightened color. To go back to your natural color, it will be necessary to apply a hair colorant comparable to your own natural shade and tone. If you have any questions about this product by Developlus, contact us by completing and submitting the form below. If you are looking for a specif part number, please include it with your message.